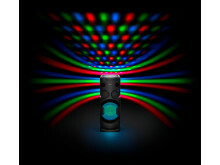 Sony launches two new High Power Audio systems, the MHC-V50D and SHAKE-X30D designed to bring the party to any room. Superb sound quality thanks to the exclusive Smart High Power Technology and Mica Cone speaker means that you can enjoy high audio quality with great power - whatever you are listening to. There are plenty of party features in these hi-fi systems for you to show off long into the night, like party lights and karaoke mode, Motion Control and DJ effects. At the same time, these new additions to the booming bass range let you freely celebrate with your guests by simply connecting your phone and hitting play on your favourite playlist; wireless music listening is possible with Bluetooth® technology with one-touch listening via NFC. 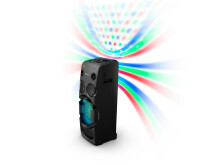 You can really get into the party spirit with the space saving all-in-one MHC-V50D. With Smart High Power Technology, that is designed to increase acoustic pressure, you will enjoy powerful bass from a folded horn chamber and an enlarged output port that increases the acoustic pressure for powerful sound you can really feel. Add to that the Mica Cone made from Mica Reinforced Cellular (MRC) fibre, making it rigid and able to hold its shape even when moving at high pressure and speed - you can drive the bass harder without compromising your audio quality. 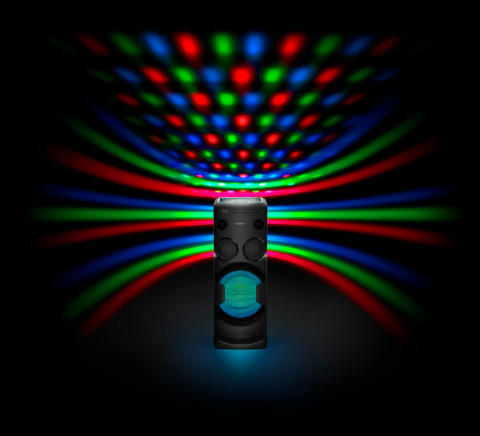 The Fiestable App lets you control the colours of the speaker lights and space-illuminating lights to sync to the beat and fill the dance floor. 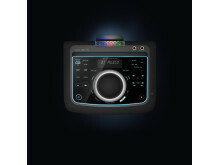 Motion Control makes it easy to operate features such as playback, DJ, sampler and lighting with a wave of your hand. The backlit touch panel lets you control it at any hour day or night. Use the dual mic input to have your own karaoke session and play around with echo and fader effects so you are the real star of the show. And for the words to sing along to, simply connect to your TV by HDMI and you can directly play a karaoke DVDs from the built in player. The V50D comes in a compact one-box design that you can take to any party with the carry handle. It is the perfect addition to enjoy any barbecue, relaxed get-together or all night party. Simply connect your mobile or tablet device by Bluetooth technology or one-touch NFC with no wires getting in the way but the same high quality sound produced by built in LDAC from Sony. 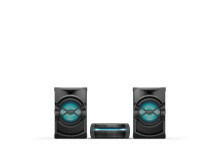 If you have room to make the party extra loud, the SHAKE-X30D is a 3 box bold design packed full of exciting features to make your party the place to be. You can shake away all night with the main unit being the centrepiece of the living room and two separate speakers that can be placed in different positions around your room – on either side of the TV for instance. 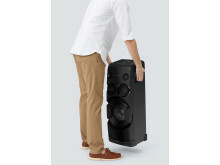 Boasting the same Mica Cone speakers and Smart High Power Technology drive the bass home and produce powerful sound without compromising the high sound quality Sony speakers are famous for. In the X30D there is a dual mic input so you can have a karaoke battle, a slot to plug your guitar in if you want to jam, and HDMI ARC input to connect to your TV. 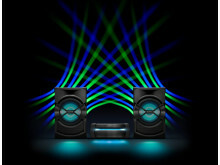 This home audio system really is the party starter with DJ features and sound effects such as echo and fader. The speakers light up and project space illuminating lightingonto a nearby wall in flashing patterns that changing colour to sync to the beat. MHC-V50D will be priced at around €500 and available in April. SHAKE-X30D will be priced at around €750 and available in June.